LeagueMath --- What is your favorite armor penetration item and why is it Last Whisper? What is your favorite armor penetration item and why is it Last Whisper? In last week's post we saw that Last Whisper topped the charts in a dubious metric of correlation with winning. Correlation is not causality, but you might feel (as I do) that Last Whisper is a pretty good item. I'd recommend it to a friend. A question is 'why?' and an answer is percent armor penetration. Because calculus and basic attacks. Here's a LeagueMath.com reckoning on basic attacks that captures most of the complexity. So, your damage per second is a function of at least seven variables, six of which are under your direct control (sadly, you don't decide how much armor your target buys). So, this should be easy, we can just make an eight-dimensional plot, look for some peaks and some steep sections, and just use hill-climbing to maximize our damage. Except you're reading this on a 2D screen and so that's impossible. An essential technique for dealing with the problem of too-many-dimensions is holding some of the variables constant, and then plotting the variance in the others. If we restrict ourselves to varying only two variables at a time, we can use color to express their effect in a contour plot. 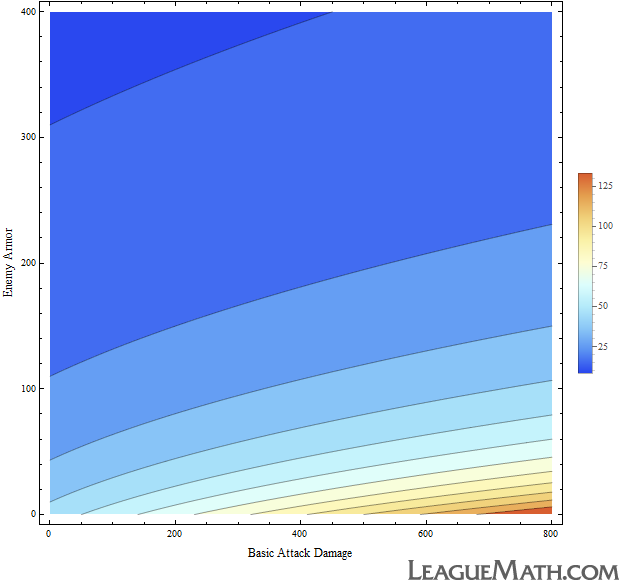 The x-axis is how much damage your basic attack would do to an unarmored target and the y-axis is how many points of armor your target has. 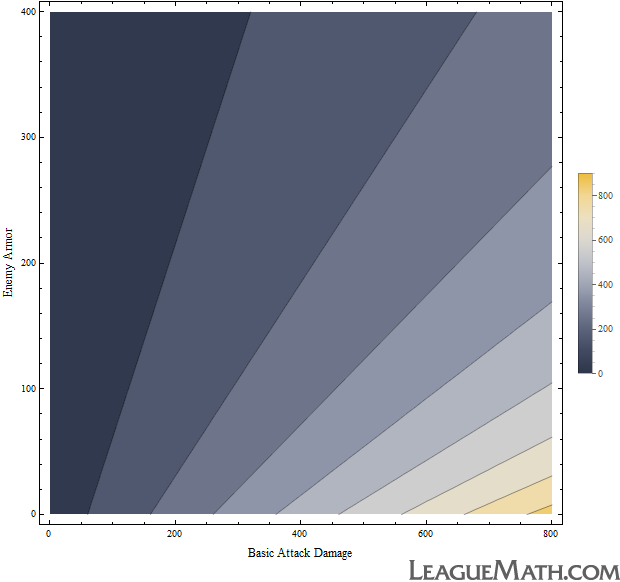 So, we've eliminated attack speed by considering only a single attack, and we've eliminated the variables associated with critical strikes by rolling them into the damage (x-axis) before we plot. The way you want to read a plot like this is by focusing on a horizontal line. Consider a case, early in the game, where your opponent has 60 armor. Find 60 on the y-axis and head to the right. Each contour line you reach represents you doing 100 more points of damage with that attack. Note that you don't encounter the first contour line until you're past the point of 100 on the x-axis. This is why buying armor is good. You need to do more than 100 damage to do 100 points of damage to an armored target. What does it mean that the contour lines are sloped the way they are? This is worth thinking about, and serves as a good exercise at this point. Ok, here's another similar chart. This chart is almost exactly like the one above, except this time you've got a Last Whisper (+40 ad and 35% arpen). The difference in the plot is quite subtle, you may need to stare for a second to see it, but the contour lines are shifted to the left (because bonus ad) and have a steeper slope (because percentage armor penetration). This means that as you move right on any horizontal slice of this plot you'll reach each contour line sooner; you're doing more damage, and each point of ad you buy is more valuable. If the differences between those two charts are too subtle for you, have a look at this one. This is a plot of the difference between the last two plots. That is, the effect of buying Last Whisper. Since it's also a contour plot, you read it the same way. Look at the horizontal line that corresponds to your opponent's armor. As you do things that make you do more damage (e.g., buying ad or crits) you move to the right on the graph. Each contour line you pass in this digram corresponds to doing 20 more points of actual damage to your target. The contour lines are steep. This is good news for doing tons of damage. Now let's look do the same analysis, but for a flat armor penetration item like The Brutalizer. 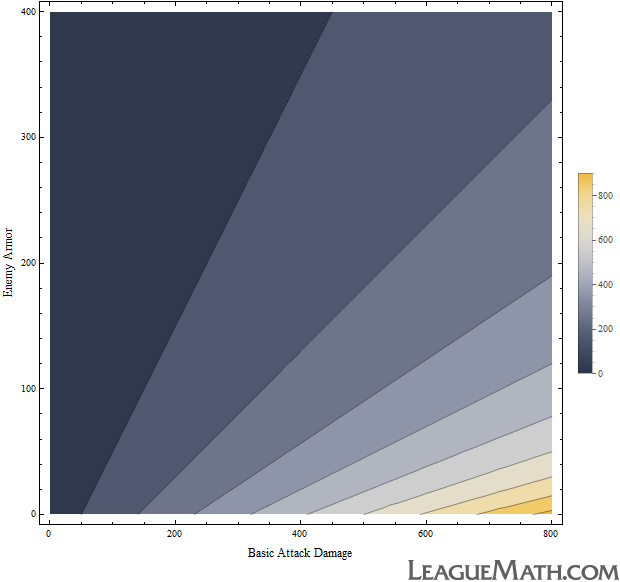 Here's the basic damage vs. armor graph again (same as the first plot above). And here's the variation on that graph after buying The Brutalizer (+25 ad and 10 flat arpen). Again, the difference here is subtle, but the equations above and a little calculus let us predict what we'd expect to see here. The contour lines are again shifted to the left (good), but the slopes don't seem to be much different. Explaining why would be an interesting exercise in an elementary calculus course. Though, just as above, taking the difference between these two plots makes the effect much more apparent. This plot shows the effect of buying a brutalizer. You know how to read this by now. The fact that the contour lines are almost flat is bad news for doing lots of damage. Another way to think about it is in terms of vertical slices of this plot. As you go up vertically, you encounter many contour lines quickly. This means that buying armor quickly reduces the benefit your opponent was hoping to get by buying a brutalizer. 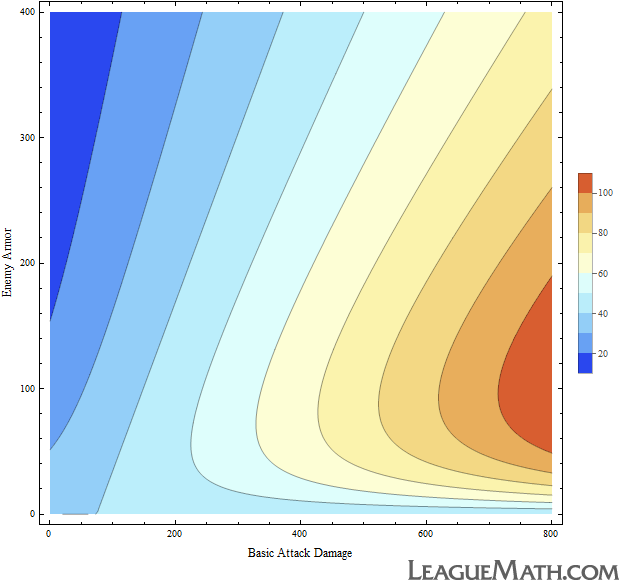 Comparing this graph to its equivalent above shows that percentage armor penetration literally puts you on a different damage curve. There's a lot more fun to be had in this area. For instance, one could plot the vertical and horizontal slices to get a better feel for their actual shape. Additional contour plots could be made for other pairs of variables in the damage equation, and for each plot one could take differences for other items / runes / masteries / etc... Many interesting possibilities. We made it through the second post. Well done. I hope you had fun and maybe learned something, I know I did both. Let me know what you think, and hang tight for more analysis here at LeagueMath.com. No items were harmed in the making of this page. Let's keep playing games to generate data; I'll keep doing math and we can all have fun. LeagueMath.com is original quantitative research and insights about the video game League of Legends. I'm compiling observations and statistics from both the game's rules and the zillions of PvP matches played everyday. With luck, we'll all learn something that will help us play better, have more fun, and win more games. I'm Harold. A mathematician, programmer, musician, and lover. League of Legends is easily the best video game ever, and I enjoy analyzing it and sharing what I find. LeagueMath.com isn't endorsed by Riot Games and doesn't reflect the views or opinions of Riot Games or anyone officially involved in producing or managing League of Legends. League of Legends and Riot Games are trademarks or registered trademarks of Riot Games, Inc. League of Legends © Riot Games, Inc.